According to Gartner, an IT research and advisory company, 54 percent of all public brand mentions on social media occur on Twitter. It’s a key social platform where most users expect their favorite brands to engage with and talk to them. And most companies are eager to reach out to their customers as quickly and easily as possible. However, responding to all of your company’s mentions without missing anything important is often quite a trick. Forgotten handles, misspellings and different variations of brand names - these are all everyday headaches of monitoring your brand's reputation on Twitter. We've got a solution for keeping up with as many of your brand mentions as possible in no time and would be happy to have your help with testing it. 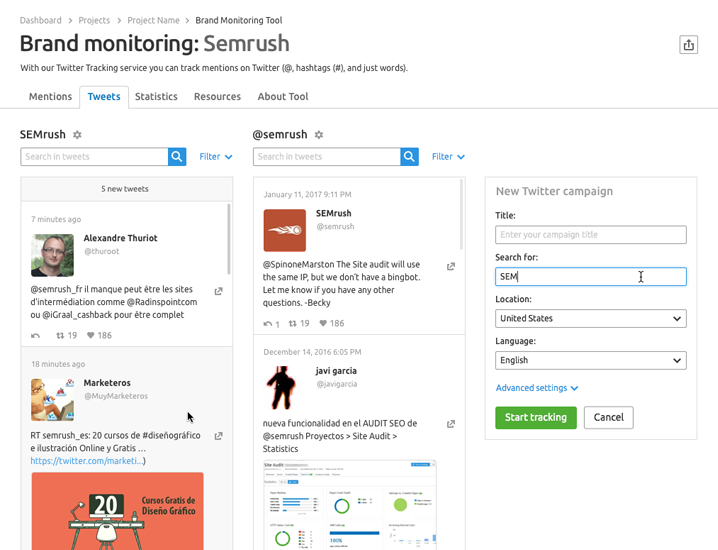 How does our Twitter Tracking service make monitoring your brand easier? Let’s take a look. Our service allows you to search for all alternative versions of your brand name or product simultaneously (e.g., ‘Semrush,’ ‘Sem-rush,’ ‘Sem Rush’) so you don’t spend too much time searching and use it to reply to brand mentions or promotional opportunities. We search keywords among words, @mentions, and #hashtags. You’ll get maximum information on what your customers are talking about. You’ll never miss a mention of your or your competitors' brand with the ability to keep an eye on your customers’ conversations in real time. Data is updated once every three minutes if you’re online, and once every two hours by default. Users search for different types of mentions, for example, brand name, competitors, and important events. Our Twitter section allows you to observe up to three mentions’ feeds simultaneously on one page, without switching between different tabs. Also, you can view all types of media content right in our service, including videos and GIFs from different sources. With this new update, you can also search for mentions using the Boolean Searching: entering context words and excluded words will allow you to narrow your results. Moreover, we’re planning to embed a new handy filter, which will allow you to track tweets by language or a country. Interestingly enough, you can search for mentions here without even connecting your own Twitter account. Please be informed that this feature has not been officially released yet and we’d be happy to get your help with testing it. Just write to us at [email protected] and be the first to try our new Twitter Tracking service. 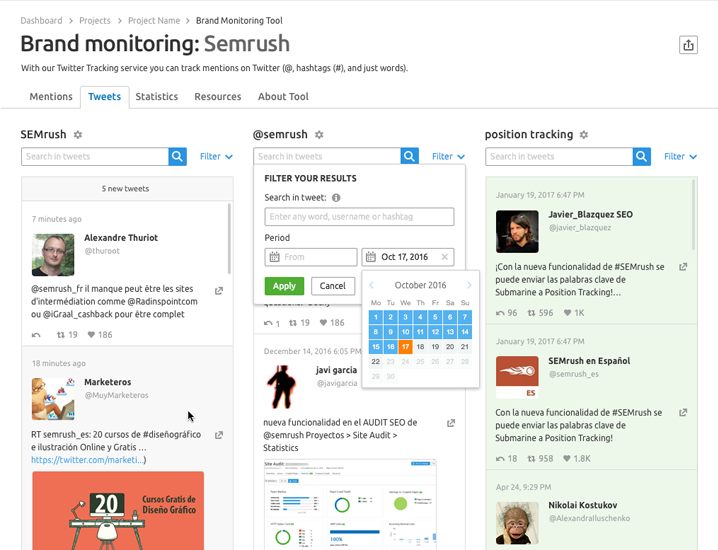 Feel free to send your feedback, which we will use to make our tool even more helpful.